Representative Steve Israel (D-NY) tells CNN’s Jake Tapper Eric Shinseki should resign, but resignation alone will not solve the problem. The full interview aired on CNN’s The Lead with Jake Tapper, 4-5 p.m. E.T. JAKE TAPPER, CNN: For the first time, a House Democrat today called for a criminal investigation into the debacle at our VA hospitals. That Democrat is Congressman Steve Israel from New York. Congressman Israel joins me now. Thanks so much for being here, Congressman. 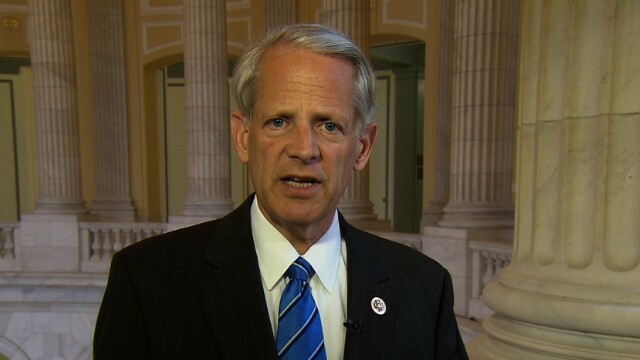 REP. STEVE ISRAEL (D), NEW YORK: Thank you. TAPPER: I want to say you’re not calling for Shinseki’s resignation at this time. Can you honestly tell me that if this exact same thing happened during the Bush administration, you wouldn’t be calling for the resignation of the VA secretary? ISRAEL: Jake, if Secretary Shinseki’s resignation is what it takes to turn over a new leaf, to reform the VA, and to restore faith by our veterans and their ability to get health care, then he should resign. But it’s not resignation alone. That’s not going to solve the systemic problems that we have. I am fed up with these problems. I have been pushing the VA since 2008 to develop public-private partnerships, because I told them then that they didn’t have the capacity. And they said, don’t worry. We have this. And that’s why we need a criminal investigation. I want to know if anybody, anybody at the VA doctored papers, engaged with a cover-up, withheld health care for veterans. They need to be investigated, they need to be prosecuted, they need to be fired and punished. TAPPER: The Justice Department has not launched a criminal investigation, Congressman. TAPPER: Have you called Attorney General Holder and said, you need to launch an investigation? Have you called the FBI director? ISRAEL: I spoke with — I contacted the attorney general today, this morning, when I read the I.G.’s report and learned that there are now 42 additional hospitals on the list. The first thing I did is contacted the attorney general, sent him a letter hand-delivered demanding that there be a criminal investigation, prosecution and punishment. I am fed up with this. TAPPER: Are you at all concerned that because of the political fallout, the risks of what this might do to President Obama’s own personal standing with the American people, that they’re not taking this seriously enough, as evidenced by no criminal investigation having been launched, despite ample evidence that criminal activities likely took place? ISRAEL: Jake, the only real fallout that I’m concerned with at this point is veterans who aren’t getting health care. I secured $7.4 million in back pay for the veterans in my district. They are the ones that we need to be focused on right now. We need to make sure that they are getting taken care of. We need to have a systemic solution to this and put the politics aside. We can blame each other all day. It’s not going to help one single veteran get health care. I want solutions. I want this process solved. I want a criminal investigation. And that’s why I called for that today. TAPPER: Congressman, obviously, you are right. There are systemic problems with the VA that go beyond just the resignation of one man. But is General Shinseki the right man to change the system that is such a problem? ISRAEL: Well, as I said before, look, I have tremendous respect for the general for his service to his country, to its four stars. But if it’s going to take resignation to turn over a new leaf at the VA, to bring in badly needed reforms that I have advocated since 2008, then — yes, then he should resign. TAPPER: But that — but you’re not calling for his resignation, just to be clear there? ISRAEL: No, I would — he should resign, in my view. But there — too many of my colleagues are just saying that that resignation is going to solve the problem. It’s not going to solve the problem. What is going to solve the problem is a criminal investigation with or without his resignation, and getting to the roots of this to make sure that it’s solved and it never happens again. You can do one, you can do the other, you can do both, but the absence of a criminal investigation and the absence of a process that gets to the root of this problem and holds people accountable for this problem is a disservice to our veterans. TAPPER: Congressman Steve Israel, thank you so much for your time. We appreciate it.